Lit, squad and the fun loving demeanor surrounding The Hunna created a playful atmosphere for their fans to get acquainted with their sound. While some take them at their fun-loving face value, there’s so much more to fall for when it comes to the immensely talented men that together make up The Hunna. 1) The band works hard in a way that’s audible, tangible and shreds the stage. Lead singer Ryan Potter and lead guitar Dan Dorney met in music college. Jermaine Angin, bass, has been playing guitar since secondary school and Jack Metcalfe, drums, all have the background too many lack or overlook in 2016. Foundation coupled with a DIY attitude and determination from early on, before any label, is a massive component of The Hunna’s success. The band acted on an innate drive to play as many shows as possible starting out. Initiative and doing it on their own terms is a huge part of what makes them 100. 2) The Hunna isn’t afraid to discuss less than ideal past industry experiences. Many artists that are rapidly gaining success wouldn’t dare open up about their struggles in such an honest way. Where most hide under the guise of “just happy to be here”, The Hunna clears the smoke in one of their most popular tracks, “We Could Be”. 3) You’ll leave the show with a new favorite song. This is a testament to how strong the live performance is coupled with a dynamically capturing sound. While many have favorites like “Bonfire” or “You and Me”, being so captivated by “Piece by Piece” in the moment, the pre-determined favorites sneak up on the audience and build the set into a roar. 4) The band lives up to the squad hype. Potter’s voice makes a flawless first impression for those seeing the band live for the first time. This is The Hunna you showed up to see and this is the experience fans hoped, paid for and then some. Not to mention the stage banter, musings and transitions from the group are endearing with a hint of troublemaker charm. Embracing every city for its nuances, with Potter sporting a Cubs crop as a nod to the World Series champs at their Bottom Lounge show in Chicago. 5) With a Reading and Leeds performance already conquered, sold out shows and tour dates added due to fan demand around the world, this is a friendly PSA to see The Hunna now. See them in a local, more intimate venue before they return and play the most popular festival in the city, because they absolutely will. Live it up at the show, dance it out with friends and keep it 100. Catch The Hunna on the Alt Nation presents the Advanced Placement Tour with The Shelters and Night Riots through the beginning of December. Tour dates and more can be found here. State Champs and Neck Deep Announce US Tour Dates With AP! 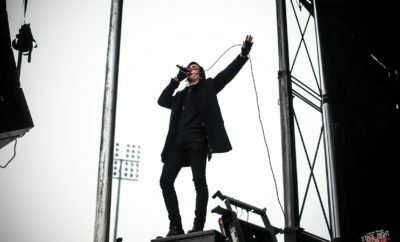 Cold Kids & Campfires Tour Photo Gallery!